Massey Ferguson 6490 tractor model launched in 2003, replacing the MF8240 Dynashift tractor. With significantly improved cab comfort with industry leading low cab noise levels of only 72dBA the MF6490 model was a sales sucess. 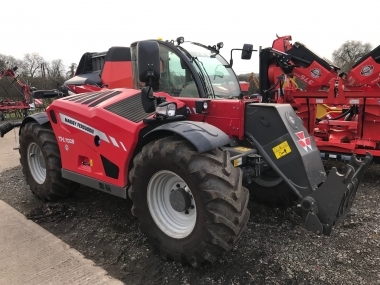 Massey Ferguson included the industry leading 'Manager 5' full manufacturers warranty up to 5 years and 6,000 hrs as an option, and this confidence was well placed with the MF6490 proving a reliable and well liked tractor model. During the model life many improvements were made to the MF 6490 model specification, including HP, tranmission and optional equipment. Find details below on the model history. Massey Ferguson 6490 tractor model specifcation. 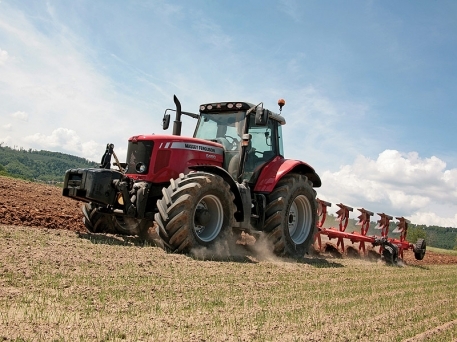 Launched in 2003, the Massey Ferguson 6490 tractor was an instant success. The bigger brother to the MF6480, the Massey 6490 with its larger chassis, 6.6 litre SISU turbo intercooled engine and initially Dynashift transmission (4 changes on the move, with a 4 speed synchromesh gearbox - and high and low ranges, giving a total of 32 forward and 32 reverse gears) was a tractor that could cope with the toughest of transport tasks (finding popularity on large muck spreaders, tankers, and big square balers). Its high power to weight ratio still made legal road transport possible, weighing in approximatly 600kg more than the MF6480 of equivalent specification. Available from the outset with Quadlink front axle suspension, the majority of tractors supplied were sold with this option. In addition to the front axle suspension on the MF6490, pneumatic cab suspension gave an excellent tractor from the perspective of driver comfort. During the model life the tractor was updated with first Tier 2 compliant engines, and then Tier 3. Transmission was updated when the tractors went to Tier 2 with the addition of two extra Dynashift gears, resulting in the Dyna-6 transmission which continued right up until the final build of this model towards the end of 2011. 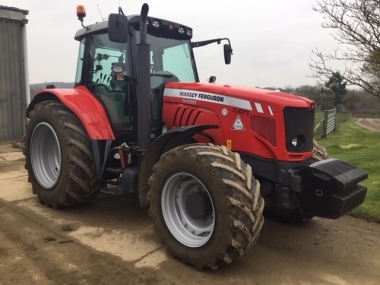 With the increase in popularity of precision farming, and autosteering options, the MF6490 tractor was available factory ready with 'steering ready' options, which were available only on tractors also fitted with the excellent DATA3 control screen. When coupled with electronic spools the DATA3 screen could be used to carry out full automation of the headland management process, activated by a handy button on the armrest of the tractor. 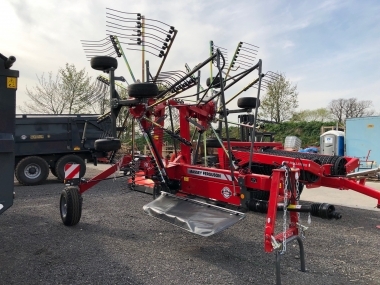 The Massey Ferguson 6490 retained the market leading Electronic Linkage System of draft and positional control, with controls to set the maximum lift height, rate of drop and sensitivity to maximise output in difficult conditions. Depending upon the task the MF6490 tractors were supplied with a wide range of wheel equipment, the major difference being whether on 38 inch rear rims or 42'. When sat on 38 inch rear wheels, the overall height was reduced, this was favoured where manouverability was key, and the MF6490 was quite often fitted with a Massey Ferguson 965 or MF975 front end loader. The MF range of loaders, manufactured by Alo Quickie, were well suited to the MF range of tractors, and proved to be a better option, relative to a telescopic handler for the leading of large square bales from the field, especially with the 50kph transmission that became available on the Dyna-6 transission tractors. Cosmetically the tractors remained very similar from 2003 right through to 2011. 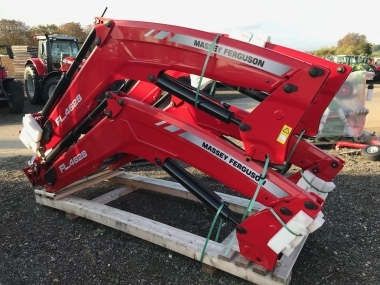 The only major differences being the adoption of a single piece plastic bonnet with the change to the common rail Tier 3 engine, and then in 2008 in celebration of 50 years of the trading name 'Massey Ferguson' the chassis of the tractors was returned to the traditional 'Ferguson grey' complimenting the strong traditional Massey red of the bonnets and fenders. 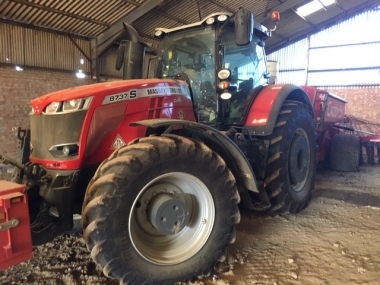 Many of the used Massey Ferguson 6490 tractors available second hand have benefited from the popular 'Manager 5' service and warranty package, and will have a full dealer service history, and consequently better long term reliability even on higher hours examples. 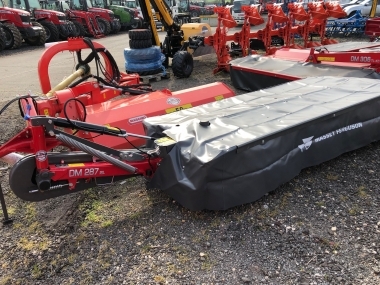 With the benefit of 10hp power boost in transport and pto operations, and a reputation against its peers in the market of excellent fuel consumption, the MF6490 makes an excellent choice of second hand tractor suiting a versitile range of applications. buy every original 6490 part online. We have a 6490 and love it. There was some transmission problems but our dealer fixed them. So far no big complaints about it. Very happy with our 6490! Plenty of power and suitably weighted as well as being comfortable and a well designed cab. Only downsides are the turning circle makes it a little clumsy round the yard and the hitch can be a difficult to see.